Are you interested in learning about the Just Leaks Crew and how we operate? 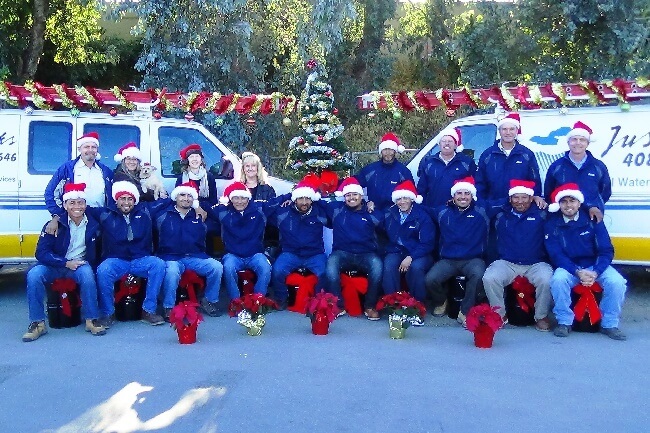 To find out more about the team that travels throughout San Jose and the SF Bay Area servicing and repairing industrial roofing systems, we invite you to continue reading. During the roofing maintenance and repairs seasons in the SF Bay Area, the Just Leaks team is broken up into crews of two. We begin each day around 6:30 AM. Since each crew is assigned to a different job site, we spend our mornings discussing our various projects and so on. We provide lunch materials to all our employees as a way to encourage proper nutrition and eliminate the need to leave the job site at the noon break. Before heading off to their roofing project, everyone will make their lunch, then load their Falcon Ranchero or Ford Service Van for the day’s assigned commercial roofs and industrial roofs. The partnership between the members of each roofing crew is critical. Just Leaks crew partnerships rarely change. The level of cooperation and understanding that develops within teams as they work on commercial roofs and industrial roofs over time together is strong. Working well with others is an important part of our employee evaluation and development program. During the rainy season when most roofs show signs of leakage, commercial roof repair is time-critical, and our team-mates need to know that they can rely on each other. We have little employee turnover at Just Leaks because we’re a San Jose-based business that works together like one happy family. We try to keep the work environment as stimulating as possible with constant training in new construction and waterproofing techniques. There are a lot of different skill sets that need to be developed to be a well-rounded and capable technician. Our employees are rewarded with incentives for quality and productivity. They also receive benefits, including paid vacation time and a health care program. Just Leaks provides tailored, experienced, and reliable roofing service to commercial and industrial operations throughout San Jose and the SF Bay Area. We are committed to repairing your roof quickly and accurately. Because of our diligence, honesty, and excellent service, we are proud to have earned the reputation as the leading roofing service in San Jose. To schedule an appointment for a free estimate, call Just Leaks at (408) 249-4646.